← How are big box stores like Wells Fargo? In the final weeks of the 2016 Presidential campaign Donald J. Trump faces three lawsuits accusing him of fraud and racketeering. 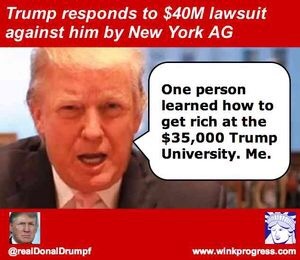 These ongoing cases focus on a series of wealth seminars called “Trump University” which collected over $40 million from consumers seeking to learn Trump’s real estate investing strategies. Although these consumer protection cases are civil proceedings, the underlying legal elements in several counts that plaintiffs seek to prove run parallel to the legal elements of serious crimes under both state and federal law. This essay provides a legal analysis of whether Trump’s alleged behavior would, if proven, rise to the level of impeachable offenses under the presidential impeachment clause of the United States Constitution. This essay begins with a summary of the evidence assembled in the three pending Trump University civil lawsuits. Next, it describes the legal claims involved in each matter. Then, this essay summarizes the applicable law of presidential impeachment under the United States Constitution and analyzes whether Trump’s actions in connection with Trump University are impeachable offenses. Finally, I offer concluding thoughts, considering in particular the policy implications of a major presidential campaign with simultaneously pending legal complaints of fraud and racketeering. Can you give people their money back? This entry was posted in Bayesian Reasoning, Current Affairs, Deception, Economics, Law. Bookmark the permalink.